Kozhukattas/modak as many know are steamed rice dumplings with coconut and jaggery/sugar mix.I have already posted a recipe of the traditional kozhukatta sometime back.These are very healthy snack or breakfast recipe as its oil free and makes perfect for kids.Similarly,I gave a try to Gothambu Kozhukatta (steamed wheat flour balls).These kozhukattas unlike the rice kozhukatta are more filling and takes time to digest.And so I made a thin layer of cover to make it tastier.You can make the traditional round balls but try making the cover very thin(though a bit time consuming) so that it gets cooked faster and is tastier that way. Coming to the filling,there is something unique.After I made the sharkara upperi(varetti),I had a little left over jaggery powder with spice mix(sharkara podi) after everyone munched the sharkara varetti.I happened to use that left over powder along with the remaining ingredients in the filling and got a way to finish too,when I first made it couple of months back.But to my surprise,the spice powders really added nice flavor and taste to the filling.The second time I made them,took a specific measurement of the spices and made so that I could preserve the recipe.So,finally here it is- am sure kids would love it and you will be happy to sneak in the protein packed chick peas too.Do give this a try for a after school snack !! TO MAKE SWEET FILLING-Soak and cook the chick peas in pressure cooker with salt until done.Drain all water from the cooked chick peas.Pat dry and add to the blender.Pulse it 3-4 times until its coarsely ground.Heat a pan and add water.add jaggery.Let the jaggery melt and then strain the impurities. pic from lt to rt-1.cooked chick peas 2.coarsely ground chick peas 3.grated jaggery to melt 4.adding chickpeas and grated coconut to melted jaggery 5.adding spice powders and filling ready. TO MAKE KOZHUKATTA-Sift the flour with salt in a bowl.Add water to the flour and knead to a smooth dough like for chapathis/rotis.Pinch out small portions(large gooseberry size) and place on a oiled Ziploc bag or transparent cover or banana leaf.Cover the other half or cover with another leaf and using the heel of the palm,thin out the ball in a disc shape or small pooris.Place the filling in the center and close in a semi circle shape to stick all ends.Using a fork mark shapes on the sides to get a neater look or use hand pie molds.Though I made a few as regular balls as we do for kozhukattas but kids liked the other one more than this as in the semicircle shapes,the covering gets nicely thinned out compared to ball shapes. Place the steamer on heat,add adequate water and place the kozhukattas.Steam for 7-8 mins or until it becomes darker in color and is cooked. Serve warm just like that for breakfast or after school snack. 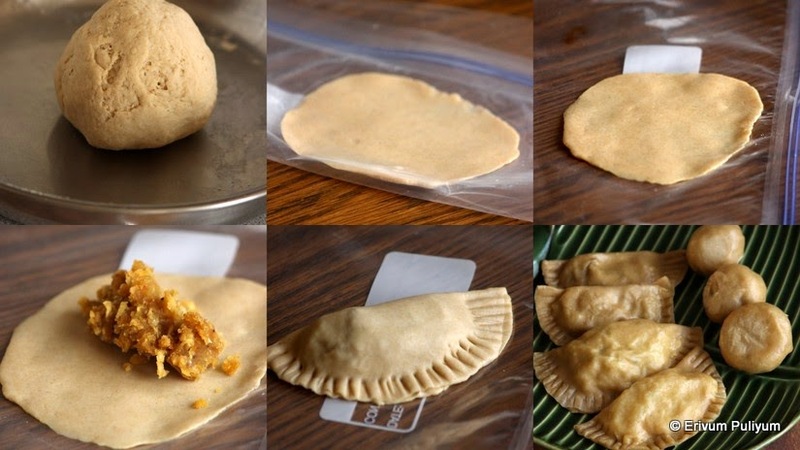 * You can use the same filling and make rice kozhukattas too,the same way as we make traditional ones or vice versa.Use the gothambu kozhukatta cover and add a plain coconut-jaggery filling too. * Soak and cook a little extra chickpeas to make this snack when you make chole masala. * You can use banana leaves or parchment paper instead of ziploc bags. Looks so delicious and tempting.. nice clicks.. Healthy way to feed kids.. Healthy and delicious snack .. Loved the filling..
Yummy kozhukatta...love the filling recipe! I have never tried kozhukattai with wheat flour, they look soft and delicious.. I'm amazed because the cover is very similar to something we make here, salty and sweet. Good recipe!